Tropical and subtropical coniferous forests are a tropical forest habitat type defined by the World Wide Fund for Nature. These forests are found predominantly in North and Central America and experience low levels of precipitation and moderate variability in temperature. Tropical and subtropical coniferous forests are characterized by diverse species of conifers, whose needles are adapted to deal with the variable climatic conditions. Most tropical and subtropical coniferous forest ecoregions are found in the Nearctic and Neotropic ecozones, from the Mid-Atlantic states to Nicaragua and on the Greater Antilles, Bahamas, and Bermuda. 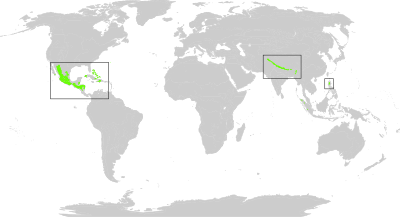 Other tropical and subtropical coniferous forests ecoregions occur in Asia. Mexico harbors the world's richest and most complex subtropical coniferous forests. The conifer forests of the Greater Antilles contain many endemics and relictual taxa. Many migratory birds and butterflies spend winter in tropical and subtropical conifer forests. This biome features a thick, closed canopy which blocks light to the floor and allows little underbrush. As a result, the ground is often covered with fungi and ferns. Shrubs and small trees compose a diverse understory. ^ a b c This article incorporates text available under the CC BY-SA 3.0 license. World Wide Fund for Nature. "Tropical and Suptropical Coniferous Forest Ecoregions". Archived from the original on 2010-05-12. ^ Perry, JP Jr. (1991). The pines of Mexico and Central America. Portland, Oregon, USA: Timber Press. ^ Borhidi, A (1991). Phytogeography and vegetation ecology of Cuba. Budapest, Hungary: Akadémiai Kiadó.